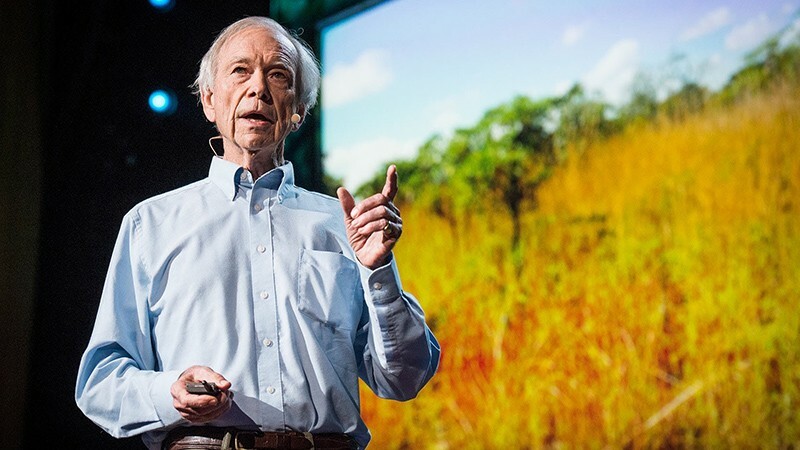 HERD MENTALITY Allan Savory's ideas on reversing desertification have polarized some in the scientific community. The Italian astronomer Galileo Galilei was famously convicted for his heliocentric blasphemy. He was sentenced to house arrest where he remained until his death in 1642. Ignaz Semmelweis, a Hungarian doctor who pioneered work on bacteria and antiseptic procedures, had it worse. He clashed with the medical establishment who didn't want to be told to wash their hands. He went insane, believed in part due to the rejection of his work. He was committed to an asylum where he died in 1865 after a severe beating at the hands of guards. In a sad irony, he died of gangrene. Biologist Allan Savory doesn't face incarceration, but he's been subjected to plenty of scorn for his belief that livestock, lots of them, are the globe's only hope to roll back the interrelated crises of biodiversity loss, desertification and climate change. "I jokingly say, 'Thank God I was insane 50 years ago,'" he says. He's spending 10 days in California to get his message out, including an appearance in Mountain View on Feb. 23 as part of the Peninsula Open Space Trust's Wallace Stegner lecture series. Fifty years ago is when the Zimbabwean-born biologist began his inquiry into the causes of desertification and habitat loss in Africa. His conclusion? Removal of livestock from the land has hastened, not reversed, its decline. The solution, he says, is more livestock, mainly cattle. "We have no option left but the use of animals," he says. "There isn't an alternative." Drought is exacerbating desertification, a condition that's particularly acute in California, he says. "The only thing that can save California from all these droughts it's facing is livestock. There isn't anything else. Some scientist needs to show us where we're wrong." But aren't cattle and overgrazing part of the problem? Globally, Savory says, herd animals once numbered in the billions. These animal clustered in groups to guard against predators and then moved on, munching and pooping their way across once-vast grasslands. All that clustering, pawing, munching and dung-dropping was the catalyst for a number of critical biological functions that promoted wildlife, plant growth, water retention and a cooler climate. As these animals have disappeared, the earth has suffered, he says. But properly managed, the reintroduction of livestock can revitalize ecosystems by mimicking once-wild herds of undulates and beating back the desertification that threatens two-thirds of the planet. "We've got to use some tool to keep these grasslands from desertifying," he says. "Technology won't save us. It's all failing." Savory has been praised as a visionary and written off as a profit-seeking charlatan. "There's no such thing as a beef-eating environmentalist," wrote James McWilliams on Slate.com in a sharply worded critique of Savory's work and his popular TED talk (3 million views and counting). Savory says the pushback against his work is part of a historical pattern and a failure to understand his work. "Every time some scientific insight has come about that is counterintuitive or that goes against the beliefs of society you always get this behavior," he says from Colorado where he heads the Savory Institute. Savory has influenced a growing number of ranchers and farmers who regard him as the intellectual champion of pasture-based, grass-fed ranching. Last year, I wrote a story about Nicolette Hahn Niman's book Defending Beef. Together with her husband and good-meat pioneer Bill Niman, they operate a ranch in Bolinas and sell beef under the BN Ranch label. Both the Niman's are devotées of Savory's work. "Cattle can substitute for wild herds to revitalize ecosystems," Hahn Niman told me. "That whole idea is incredibly revolutionary." Doniga and Eric Markegaard raise beef cattle in coastal San Mateo and Sonoma counties. "We're very much aligned with Allan Savory's teachings," says Doniga Markegaard. One of Savory's key messages is a counterintuitive one: resting land is highly destructive and promotes desertification. Grass that doesn't get munched by animals dries, oxidizes and dies, a process that results in desertification. The Markegaards have seen that first-hand on their land. But pasture that set idle for 15 years sprang to life once they increased cattle on the land. "We've seen in as short as six months more life coming back," says Markegaard. Daniel Olstein, POST’s vice president for land stewardship, says his organization does not formally endorse Savory’s work but he has seen the benefits of grazing on POST-protected property in the form of more perennial grasslands which in turn increases carbon in the soil. “That’s very exciting,” he says. Savory says institutions and governments have been reluctant to heed his message because history shows they are not capable of leading. He says a shift in public opinion must come first. "Leadership cannot ever come from politicians," he says matter-of-factly. "It cannot come from universities or cattlemen's associations. The leadership can only come from people." Word is spreading. He says his holistic grasslands-management techniques are being practiced on more than 50 million acres on six continents. "It's spread through individual farmers, ranchers, pasturists who see that it makes sense, that it's practical, and they see the land recover."